Anesthesiologists are a bit like a flight crew on a commercial airplane — they go about their business so efficiently and so professionally that you may not pay them much attention. But if it comes down to it, they can save your life. “You don’t become an anesthesiologist for the glory,” said Lysa Posner, professor of anesthesiology at the NC State College of Veterinary Medicine. But glory has found Posner. 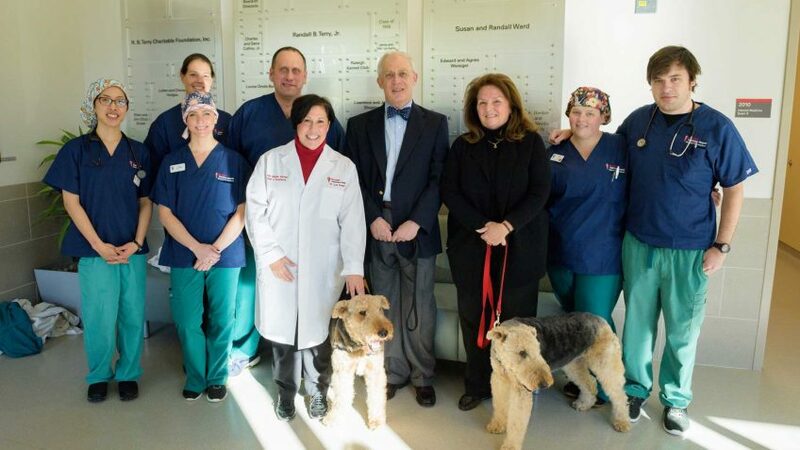 She recently received a Coat of Excellence from David and Crystal Steffen of Southern Pines after Posner helped treat their dog, Winston, who had bladder cancer. With a $10,000 contribution to the North Carolina Veterinary Medical Foundation, honorees are presented with a white lab coat emblazoned with their name and the name of the pet they treated. 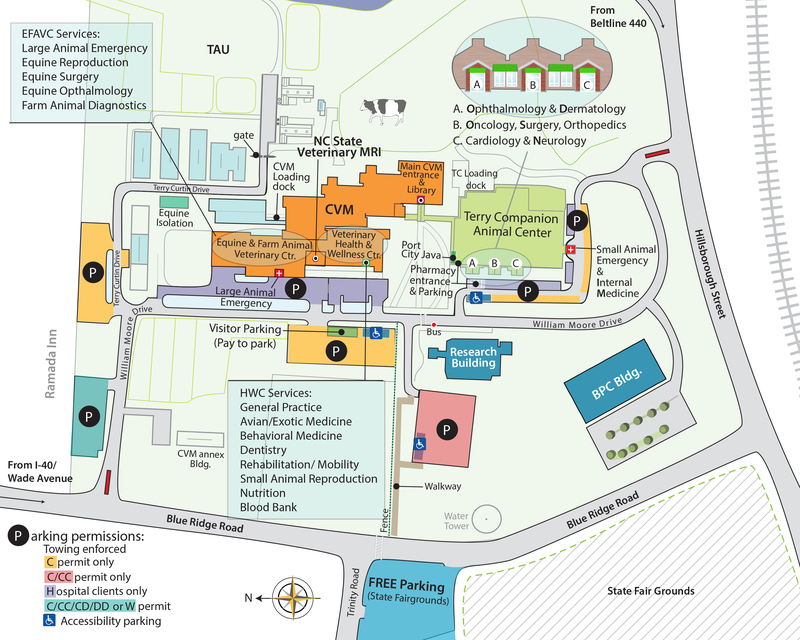 It honors extraordinary veterinarians while also helping to fund the extraordinary care animals receive every day at NC State. 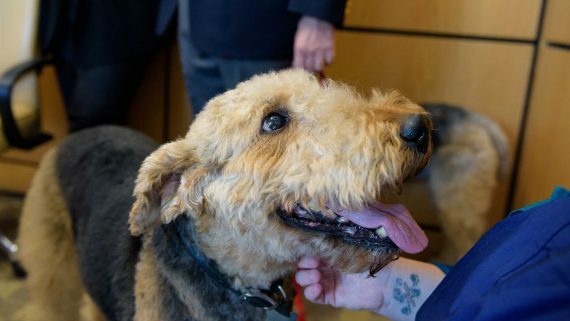 Winston is an 11-year-old Airedale who, along with his partner in crime Maggie, brings high energy to the Steffen home. After being diagnosed with bladder cancer, Winston was referred to NC State for radiation therapy in June. As the first step in planning for his treatment, Winston was scheduled for a CT scan, generally a routine procedure that includes anesthesia. The test got underway; Winston had an IV and a tube in his airway. At first everything seemed normal. About five minutes in, Posner said, the team noticed that Winston’s heart rate began to slow. Then there was no pulse. Winston had gone into cardiac arrest. Winston Steffen, an 11-year-old Airedale. She recalls that there were two residents and five veterinary technicians also in the room, along with a group of students observing. The students immediately stepped back and Posner, the senior clinician, took charge. As the team worked to resuscitate Winston, Tracy Gieger, clinical associate professor of radiation oncology and Winston’s oncologist, was on the phone letting the Steffens know what was taking place. “Within four to five minutes, we got a spontaneous heartbeat,” Posner says. An hour later, it appeared that Winston had not suffered neurological complications. He remained in the ICU for observation but soon returned home with the Steffens. After the close call, the Steffens and the medical team at NC State agreed that the risk of further treatment was too great, and Winston remains at home receiving regular medication. As of late October, Winston was still actively enjoying life with Maggie and the Steffens. 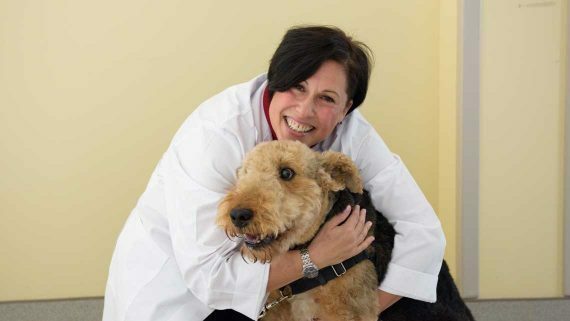 Lysa Posner, professor of anesthesiology, with Winston. Now the entire 22-person anesthesiology team sports matching blue shirts with the inscription, “Winston’s Team Anesthesia.” It’s especially meaningful for a service providing critical support for almost every other service in the hospital while often remaining under the radar. For more information on the Coat of Excellence program and other giving opportunities, go here.